Strategies on Mechanical Ventilation in Newborns and Infants. April 6–8, Prague, Czech Republic. Lecturer and Chairman. Neonatal Imaging. October 4–6,1999, Prague, Czech Republic. Organizer. High Ferequency Ventilation in Newborns and Infants. March 21–23, 2002. Prague. Lecturer and Chairman. High Ferequency Ventilation in Newborns and Infants. May 26–28, 2003, Sopron, Hungary. Lecturer. High Frequency Ventilation in Newborns and Infants. May 26–28, 2005, Erlangen, Germany. Lecturer. 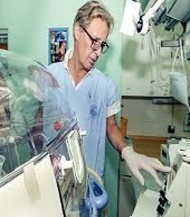 Neonatal pulmonary critical care. October 22–24, 2009, Prague, Czech Republic. Lecturer and Chairman. Care of the Extremely Preterm Infant. Oct. 29 – Nov. 1, 2014, Prague. Lecturer and Chairman.